#RogueWBC10 was an ill conceived idea by a motley crew of Seattle based wine bloggers given life in the tasting room of Efeste in Woodinville. I was introduced to Duane of Wine Foot a wine blogger that I only knew from twitter. The upcoming Wine Bloggers Conference in Walla Walla was a common topic of conversation for local wine bloggers. The cool kids were signed up, reservations made, blogs submitted, twitter chat full of meet-ups and anticipation. The standard question of “are you going” was exchanged. We determined that at that point we were not going primarily because we had not registered, it was sold out and our ambivalence about attending was preempted by the the lack of an option. But not going didn’t mean that we would not be present in Walla Walla during the conference we would just not be at the conference. Brennon, the winemaker for Efeste, unknowingly joined the conversation and for some reason the word rogue was thrown into the mix and the rest is now history. The European wine bloggers arrived in town and hosted a great gathering of like minded wine bloggers. Pouring Austrian wines they provided us with a taste of wines from the sponsoring country for the European Wine bloggers conference to be held in Vienna, Austria, October 22nd-24th. The Europeans were led by Spain based @catavino, Portugal/Port maker @Quevedo and Frenchwinemaker @MissVickyWine and I will have to say the group continued to inspire the rogue amongst us. The weekend unfolded as any well planned rogue wine weekends should. My launch date was Friday, June 25. A minor obstacle arouse for me. My dogs had no place to stay and the thought of big dogs on a rogue weekend wasn’t my idea of a good time. Momentarily delayed I called @celo4life. He was on task arriving in Prosser as I called to say I was M.I.A. due to ….dogs. Amazingly unfazed he told award winning winemaker Andrew Martinez of Martinez and Martinez about my dog issue and problem solved for the moment. Andrew had offered to take care of them for the weekend. Prosser: Arriving in Prosser Saturday afternoon a day late but this is rogue. I drove to the Martinez residence to meet up with @Celo4life who had been planted in front of the TV watching the moment to moment World Cup US teams demise losing to Algeria. I’m greated by Andrew, his beautiful kids, and his dogs pit bull Kilo and 10lb tank Coco. Great dogs but my old toothless Coonhound couldn’t wait to take Kilo on. No place at the inn again… damn dogs. It became clear the dogs were going-rogue. So, the wine adventure began for me. @Celo4life was still recovering from a full evening spent with the Martinez and Martinez crowd, Coyote Canyon and a few other local folks. But I couldn’t wait to see my friends at Pontin Del Roza. They have a beautiful tasting room off the beaten path set amongst the vineyards owned by the Pontin family. The wine part of the family farm is run by Scott Pontin. We taste through their fabulous 2010 offerings that started with their Dolcetto Rose’ a fabulous summer wine and great way to start a rogue wine weekend. At the end of the tasting we ask Scott about his preferred and recommended road less traveled to Walla Walla. Waitsburg: An hour later we arrive in Waitsburg. Holy cow…who knew. We try to get into Waitsburg’s famous Woop ’em Up cafe with no reservation on a Saturday night and it’s a big “no” go in fact I think they even laughed at us. How naive to think that we could actually get a seat in a restaurant named Woop ’em up without a reservation. We pick ourselves up from the indignity and head across the street to the Jimgerman bar. 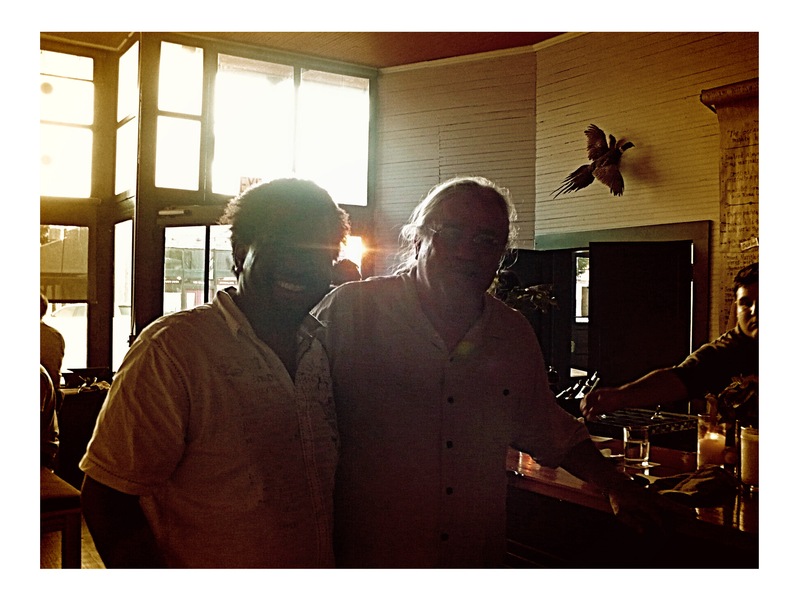 There we run into a couple of the locals like winemaker Charles Smith. Sitting at the bar we order Mojitos. Trying to figure out what the town was about we ask the owner/bartender what is up with this town. Come to find out Charles Smith owns the building across the street and this is an up and coming next generation Walla Walla or Walla3. But I’m sure most of you reading this already knew all that. Our luck in Waitsburg was changing. Sitting next to us the bartender introduces Dean Morrison, winemaker, grape grower, musician, owner of Morrison Lane winery in Walla Walla. I think he was also getting a chuckle out of these Seattleites lost in Waitsburg. Dean realized @Celo4life knew something about music and’ wine so a life long friendship began. Dean invited us to meet his friends and members of 1950’s band called The Gems. They were getting ready to play to a packed tavern in the middle of Waitsburg. The music starts and @Celo4life and I looked at each other at almost the same time saying “you can’t make this stuff up”. This band rocked they were well oiled, experienced musicians playing 1950’s surf music…. in Waitsburg. 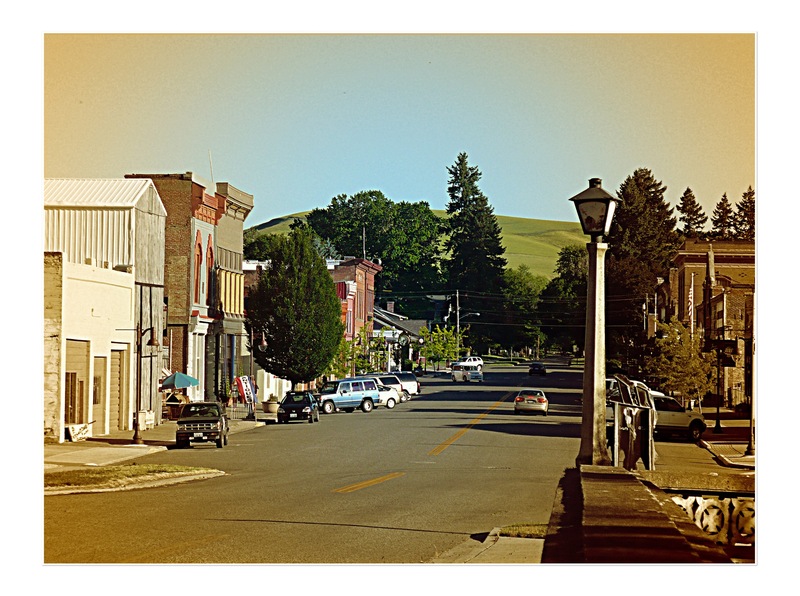 Walla Walla: The time came to leave Waitsburg. We follow Dean to the next stop… Walla Walla! I check into the Holiday Inn Express who happened to let me keep my two dogs there and then headed into town to catch up with Dean at his tasting room and then on to the Past Time for a party put on by Charles Smith. @Celo4life was busy finding a place to stay in Milton Freewater as Dean poured his wine. Somewhere around the early am next door at Charles Smith’s Past Time Cafe we meet Christophe, winemaker for Cayuse and still no bloggers… So, we decided to go to the Marcus Whitman Hotel to see what we could find. A small group lingering by the back entry looked like a bunch of wine scribes. We introduce ourselves to the group sure enough…bloggers. Dean ran back to the winery and brought back some of his Nebbiolo. The high brow wine folks there were dismissive saying Nebbiolo can’t grow in this region…only Piedmont. After some convincing Dean poured the wine and the world was good again. Wooed by his expertise and good wine I think Dean convinced a few that as a young grape in the State Nebbiolo has potential as a matter of fact Washington as a wine growing region has great potential for a bunch of different varietals rivaling California for that matter. 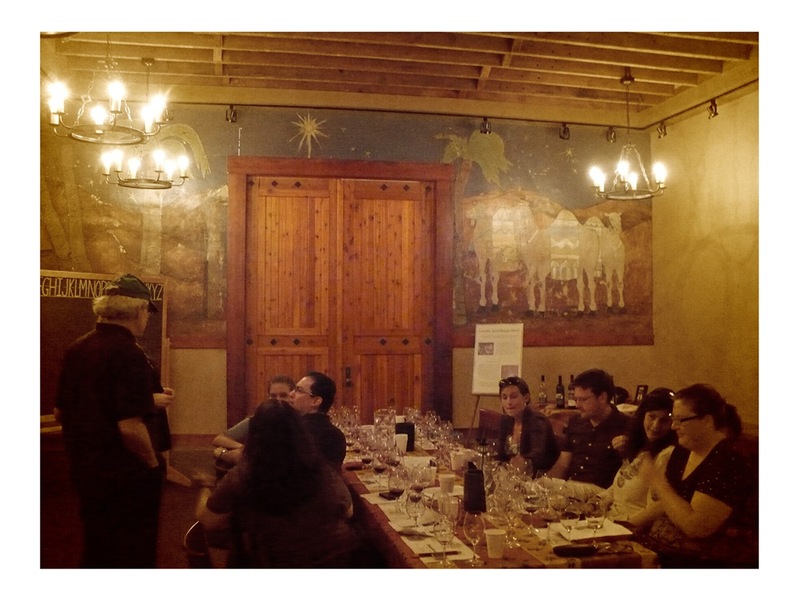 So, 3 am at the back door to Walla Walla’s most prestigious hotel and site of the acclaimed Wine Bloggers Conference winemaker Dean was preaching about the merits of Washington wine to the marketing folks for E. & J. Gallo wine…. and the rest of the wine bloggers that were still standing! The sun rose glistening above the sleepy town of Walla Walla a new day for some just an extension of the same day for @celo4life and me. A visit to the farmers market where a very old serenading Elvis in polyester had the crowd mesmerized added another layer of rogue to the weekend. Off to Forgeron Cellars and then appropriately an invite was extended to join the bloggers at school…L’ecole 41 that is. I guess they had heard that there were a few rogue truants in the area. On our best behavior we toured the immaculate wine production facility and then were led down to the school’s cellar. A long table was beautifully set and prepared for a vertical tasting. L’ecole’s famous cellar room had previously served as the schools auditorium. Children held their annual Christmas plays there and the mural for the play can still be seen today. A more apropos setting for a couple of rogue characters could not have been imagined. Wine glasses filled with some of the finest well crafted wines in the area starting with 1999 Apogee and a 2003 Estate Perigee, tasting through to 2007. A bit of schooling about the terroir, great conversation with talented and inspiring wine bloggers is how @celo4life and I found ourselves. And that is where #RogueWBC10 came to an end. A brief spontaneous trip through wine country a reminder that going rogue down that road less traveled sometimes is the only way to go!